The Navy Buddy Enlistment Program provides for the enlistment of small groups of not more than four male individuals or four female individuals who wish to remain together for as long as possible during their enlistment. The program should be conducive to stimulating enlistments among high school graduates and others from a local area and assists enlistees during the transition period of adjustment from civilian status to military status. Enlistment in this category is restricted only in that all individuals start recruit training on the same date. Any mixture of enlistment programs is authorized. Recruiters should make clear that recruit training is for approximately 8 weeks and does not include subsequent apprenticeship training. Because of distribution and assignment constraints, women are eligible for this category only. Buddy groups may consist of Seaman and Fireman apprenticeships only (that is, no Airman apprenticeship may be enlisted Buddy with anyone in the Seaman or Fireman apprenticeships for assignment to initial duty station). Seaman and Fireman in a buddy group may not undergo apprenticeship training together, although they will receive orders to the same initial duty station. Airman apprenticeship buddy groups may consist of Airman apprenticeships only. No expressed or implied guarantee may be made that buddies will not be separated by transfers after reporting to their initial duty station. No buddy group may consist of more than four individuals. No buddy group may consist of more than two individuals when assignment to initial duty station is guaranteed. All members of anyone buddy group must be enlisted on the same day at the same Military Entrance Processing Station (MEPS) and arrive at the same RTC together. Applicants enlisting under the Subfarer option will not be permitted to enlist under the Buddy Program for guaranteed assignment to an initial duty station. They may, however, undergo recruit training together. Because recruit companies are all-male and all-female, buddy groups must be all- male or all-female. Sickness or other medical reasons. Failure to show satisfactory progress in recruit training or apprenticeship training. Failure of one or more of the group to meet the minimum requirements for regular recruit training or apprenticeship training. Change in the coast of choice by any member of the buddy group. Failure to meet minimum water survival qualifications. 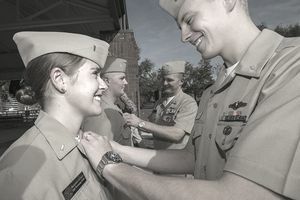 Acceptance in another program that requires a different flow of duty assignment between completion of recruit training and first duty station (for example, if member enlists in the Seaman/Airman/Fireman and Buddy Programs for guaranteed assignment to initial duty station and subsequently elects to extend his enlistment during recruit classification to be eligible for assignment to Class “A” School). Request of any member of a buddy group to be dropped from the buddy group. Guarantees remain in effect for the other members of that particular group of buddies. Other circumstances resulting in a delay during or after recruit training. The importance of reporting to the Liaison Petty Officer as soon as possible after arriving at RTC the fact that of being separated from his or her buddies. That in cases of different assignments to recruit companies the recruit should notify the receiving officer. That is the case of receiving orders to different duty stations the recruit should notify his or her Company Commander.